This pasta with an Asian twist will never replace the classic dishes of Italy but it does give us a new and different way to cook up the flavours we love. 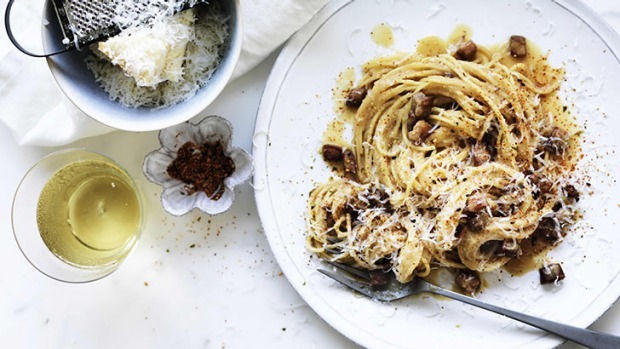 Spaghetti alla carbonara gets a umami-rich miso paste added to its creamy egg-and-bacon sauce. 1. In a large bowl, beat the eggs, extra yolk, miso paste, parmesan and black pepper until smooth. 2. Cook the pasta in a large pot of boiling, salted water until al dente. 3. Heat the oil in a large frypan, and fry the bacon over medium heat until crisp. 4. Drain the pasta well, and combine with the bacon in the pan, tossing vigorously until coated. Add the pasta to the egg and miso mixture immediately, tossing well so that the heat of the spaghetti cooks the egg into a creamy, cheesy, coating. 5. Serve in warm pasta bowls, scatter with grated parmesan and togarashi sprinkles and serve immediately.